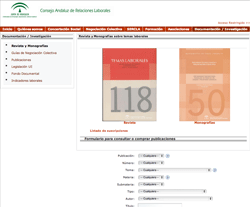 A listing of the latest published volumes of Temas Laborales is available by clicking here. The Andalusian Industrial Relations Council has developed an online tool to purchase single copies or subscribe annually to labour magazines published by the Council. The price of an annual subscription is 72€ and includes four quarterly issues and a special monograph; the price of a single issue is 18€. Click “Pagar la tasa” (Check the rate), and follow the instructions from the online payment service. * The subscription must be renewed annually. For more information, e-mail publicaciones.carl.ceice@juntadeandalucia.es or contact the Council by telephone at 955 066200. The entire title should be in capital letters, bold, centered, and in 14-point Times New Roman font. The author’s name should be in capital letters, not bold, aligned right, and in 12-point Times New Roman font. The author’s academic discipline and/or professional accreditation, with reference to the body and area of knowledge should be in italics, aligned right, and in 12-point Times New Roman font. The university affiliation should be aligned right, not bold, and in 12-point Times New Roman font. In a box which does not exceed 15 lines the author should review basic conclusions of the thesis or work. Avoid summarizing aspects of the article that the reader can deduce from reading the index. The index of the study should always use Arabic numerals, never Roman or alphabetical letters, and should not exceed three section levels (eg 2.4.3). Paragraph titles should reflect literally, with full agreement, the meaning of the subsequent text. Titles should be in bold, with section titles (e.g. 1) capitalized and subsection titles (e.g. 1.1) not capitalized, and in 12-point Times New Roman font. There should be no period at the end of section titles. If possible, please deliver in Microsoft Word format, using 12-point Times New Roman font. Avoid using bleeds (ie. placing content to the edge of the page). Try to avoid highlighting body text in capital letters, bold, underline or italics. Use italics only for foreign words. You man use footnotes or the Harvard system (author, year of publication, page). If you use the Harvard method, please incorporate a bibliography at the end. Try not to exceed 25 pages, with a minimum of 10.